This 40mm. ROLEX SUBMARINER is an amazing looking example. The matte dial has a deep black matte finish with original vanilla lume. The hands are original with some aging and (usual) slightly deeper colouring due to the difference in lume thickness compared to the dial. The beautifully faded ghost bezel is a natural fading from sun and looks fabulous in person! The automatic winding movement was cleaned and is accurate. The sapphire crystal is scratch-less. There are no dings or major flaws. The case has not been over-polished. 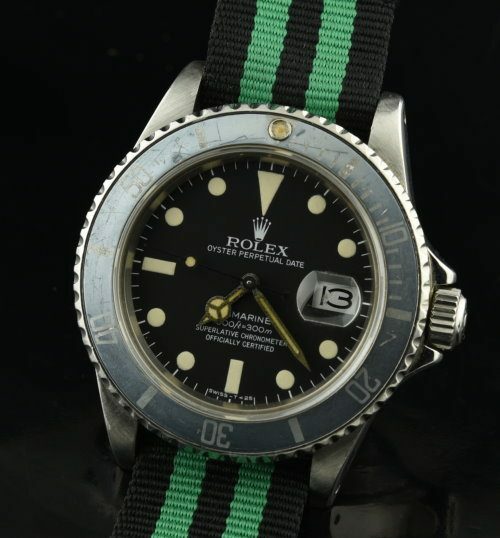 This ROLEX SUBMARINER will sell fast.